Today I have Liz of The Lemon Bowl guest posting today. As some of you know, Liz hosted Taste of MI with me and I could not be happier to have her here posting. Her site is full of delicious and healthy recipes. Something I desperately need as I try to shed baby weight! Liz just started a great new series called Healthy Habits, which focus on ways to improve your health and life. It has been great so far and it has only just begun! To get a taste of what Liz has to offer, check out these great recipes: Black Bean and Barley Salad, Orange Cranberry Smoothie, and Beef Shawarma with Cucumber Yogurt Sauce. This isn’t boring soup – this Creamy Butternut Squash Soup has smoked paprika to keep things interesting. And it’s super simple to make! Happy Friday! My name is Liz and I’m the author of The Lemon Bowl, a healthy food blog full of tasty recipes that just so happen to be good for you. As a fellow Michigan gal, I am thrilled to be guest posting for Rachel today. After countless emails and tweets, it was so fun to finally meet Rachel in person when we co-hosted Taste of Michigan last year. She was 7 months pregnant at the time so I’m hoping our next visit involves a snuggly little man. 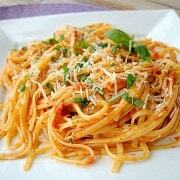 As a mother myself, I can appreciate recipes that are not only easy but also nourishing. With two little ones at home, I thought this simple butternut squash soup would be the perfect dish for Rachel to make for her family. It is also a great recipe to double and freeze for a later time. BTW – I happen to know that Rachel does not enjoy peeling butternut squash so I created a recipe that skips that step entirely! What are friends for, right? This creamy butternut squash soup is perfect for cold days. Pre-heat oven to 350 degrees and line baking sheet with foil; set aside. 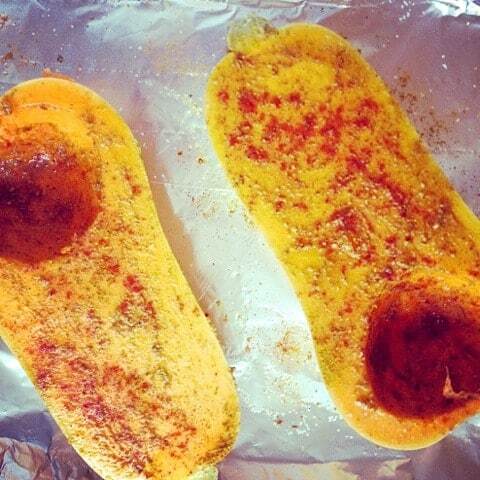 Rub butternut squash halves evenly with olive oil, smoked paprika, cayenne, salt and pepper. Place on baking sheet, flesh side down, and roast 45 minutes or until soft. Heat soup over medium heat, stir in lemon juice and check for seasoning. 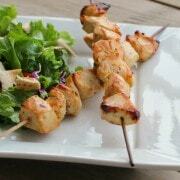 Add salt and pepper if necessary and serve with plain yogurt and fresh cilantro if you wish. Thanks again, Liz! Cannot wait to try this delicious looking Creamy Butternut Squash Soup. So happy to hear you liked this soup! Thanks for taking the time to come back leave a comment! The most essential thing I learned from taking a knife skills class with Chef Shuna Lydon , other than the obvious tip of keeping your knives sharp, was the importance of stabilizing whatever it is you are attempting to cut. This is nowhere else as critical as when cutting a butternut squash, a notoriously difficult task because of the thickness and density of that squash. The most important thing to consider when following these steps, or anyone else’s steps for cutting winter squash is to keep whatever pieces you are working on as stable as possible. The first cut from the bottom of the squash is to help keep the squash steady on the board as you gently work your knife down from the top to bottom. So stunning! I love this kind of soup for a healthier comfort food come winter. Liz is adorable. I can’t believe she made this so specifically for you! You love squash and hate peeling it! She’s so sweet! This is gorgeous! I adore butternut squash!! Looks so creamy! What a great recipe Liz! Oh my… this soup looks so good. I love using smoked paprika in my recipes. 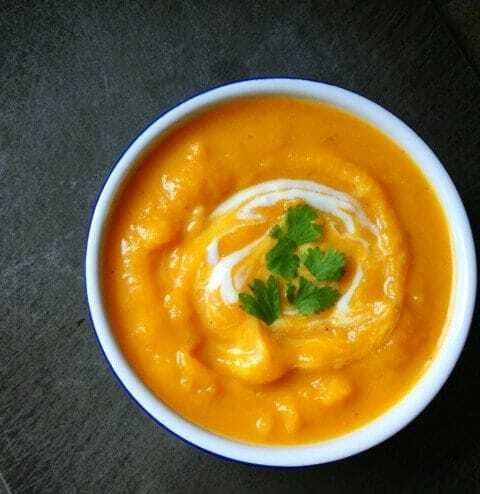 Great recipe, and what a gorgeous bowl of soup! I love the no peeling myself. That prevents me from cooking with it, to be honest. Just wanted to say that I’m a big fan of the new “Healthy Habits” series. It’s going to be so beneficial for myself and so many others! XOXO Rach and Liz!! Muah! This looks so good!! 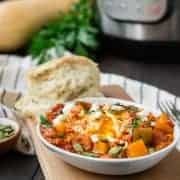 I love adding smoked paprika to squash soups!! 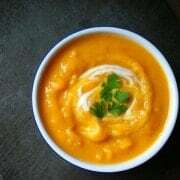 Beautiful looking Soup, I love butternut squash so this recipe is totally bookmarked. Thank you so much – I hope you try it!! We loved it. I love love love me some butternut squash. Half the time when i make it it never makes it to the recipe, because I just eat it straight from the pan. This soup look so yum! You had me at “no squash peeling”, hooray! haha – I’m glad you appreciate the no peeling, Abby!! Let me know what you think! this soup looks so delicious, hearty, and healthy! I know what I’ll be making with the butternut squash sitting in my fridge.